So far, we have received 71 entries into the contest for 20 free lifetime licenses with a retail value of $29.95 US, to given away, for the Professional Edition of SUPERAntiSpyware. Enter today and take advantage of these great odds. With a free lifetime licenses for SUPERAntiSpyware, you’ll never have to pay another penny, ever, to ensure your computer system stays safe from Trojans, Spyware, Virus’, Phishing Scams, and Identity Theft Scams, and more, circulating on the Internet. To enter the contest to win one of the lifetime licenses, simply add a comment at the end of this article. On August 24, 2009, all comments will be added to the online List Randomizer, and the first 20 names that come up, in random order, will win a free lifetime registration code. Read the following review and I’m sure you’ll agree this is a contest worth entering. Since I had test driven the free version of SUPERAntiSpyware earlier this year, and found it to be equal to its excellent reputation, I decided to go for a run with the professional version. No surprise then, when I found that the professional version, which includes real time protection against infection, lived up to its reputation as a premier anti-malware tool. In a world of hyperbole, exaggeration, overstatement, and embellishment, the SUPER, in this case, means just that. It would be hard to argue with the 15 million + worldwide users who have chosen to protect their computers with this straightforward application with its simple, intuitive, and easy to use interface – and I won’t. SUPERAntiSpyware deserves the kudos it regularly receives from both computer security gurus, and users. 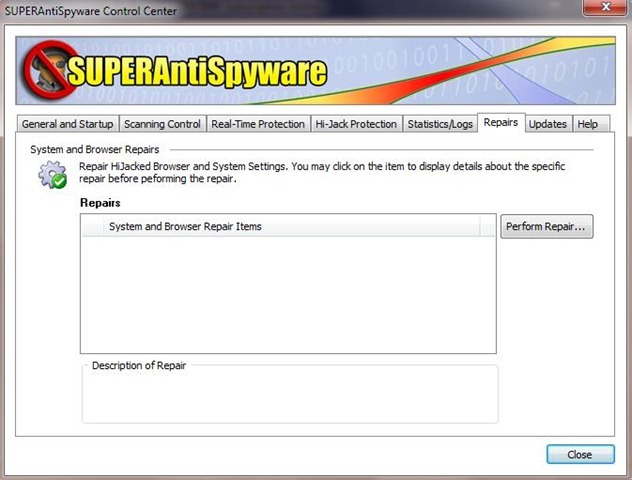 I found SUPERAntiSpyware very easy to setup, customize and run, for both less experienced and expert users alike. No fussing and bothering with a ton of long winded setup or customizing screens – just install, and after choosing a few run options, you’re good to go! SUPERAntiSpyware is well known for its high malware detection rate, and in fact, it found and eradicated every one of the test malware samples installed on my test platform. An extra feature in this anti-malware product really caught my attention; a repair function which allows the user to recover settings frequently wrecked by malware, and which are often not recoverable despite removal of the malware process. These settings include broken Internet connections, lost desktops, the ability to edit the registry and importantly, access to the task manager. If you have ever struggled with this difficult issue you know how important a repair feature, such as this, can be. 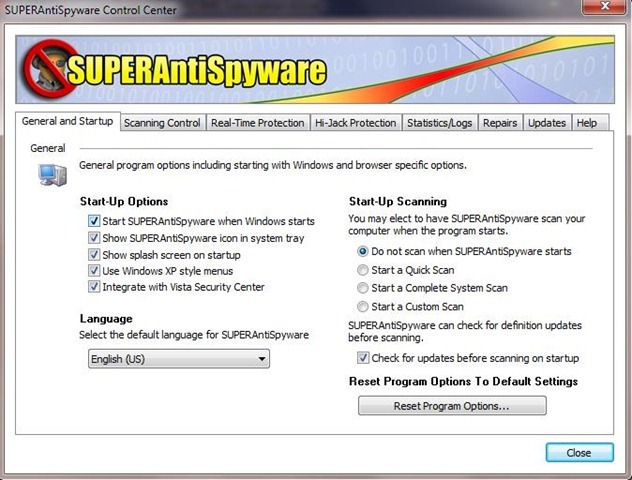 SUPERAntiSpyware offers a freeware version (downloadable at the main SUPERAntiSpyware site), which does not however, provide real time protection against infection. I do not recommend then, that you use this free version of SUPERAntiSpyware as a stand alone security application since it simply will not offer you adequate protection. Instead, if you choose to install it, use it only as an on-demand canner. Alternatively, you may download and install a fully featured 30 day trial version of SUPERAntiSpyware Professional from the download link below. Note: As of August 6, 2009 SUPERAntiSpyware is Windows 7 32 bit ready. Conclusion: Given the increasing number of Trojans, Spyware, Virus’, Phishing Scams, Identity Theft Scams, and additional malware threats we now face, it’s critically important that you chose an anti-malware product that does what it says it will do. Not all anti-malware applications are created equal, but SUPERAntiSpyware deserves its reputation as a first class security application. It’s definitely worth considering adding to your security toolbox. Regular readers of this site are aware that I generally do not recommend the purchase of commercial software, but in this case, I have to do so. This application is just that good. As a full fledged security application, with all of its features; real-time protection, scheduled scanning, and scheduled updating activated, SUPERAntiSpyware is very well priced at $29.95 US, for such a potent anti-malware application. Also thanks, I have the trial version and it seems to run fine when I remember, so it would great to have the real time version. Bill Mullins is the reason my computer works, why my moderately elderly parents’ computer works, and why my considerably elderly aunt and uncle’s computer works. Thanks. What a pleasure it was to read your comment. Thank you for this. Wow, this is great stuff! SUPERAntiSpyware is very well regarded in the tech community. Thanks for the chance to win the Professional Edition. Would love to have this awesome app on my PC. A huge thanks for this giveaway. I would like to test it. I would like a try. The difference between Pro version and Free version is real time blocking or scheduled scanning. I agree that SuperAntiSpyware is the Best Software for eliminating Harmful Threats from Computer! This product is truly exceptional! 15 million users COULD be wrong (well, it is possible), but not when the top PC techies are all singing it’s praises. Besides, if so many users purchase a product there tends to be something I like to call the ‘credibility effect’ that comes into play. Sure they could all be wrong but the odds are so astronomical as to be ludicrous. I have used the free trial version, and I’m here to tell you it ROCKS! I am a BIG fan of SuperAntiSpyware. Though, i only have the free version. Exceptional software. Thanks for all the Information that you share. Would very much appreciate a professional licence for this great software. I’ve been using SuperAntiSpyware (free version) and find it an excellent addition to my toolbox. A license would just be the cats pajamas. I have been using SAS for a while and it has saved me on numerous occasions from malicious softwarre. It’s a fantastic product and would relish the opportunity for the Pro version.